The Gospel Station's own Southern SONlight is a southern gospel group with many original songs, plus the favorites you all know and love. They have sung all across Oklahoma and surrounding states for many years at churches of all denominations, and at numerous community events. The group's members are Randall Christy, David and Sharla Frederick, all from The Gospel Station and Union Valley Baptist Church in Ada, Oklahoma. Randall Christy sings lead and harmony vocals for the group. He has also written several songs that the group has recorded, such as "When I Got Saved" and "He'll Lead You Back Home". He is President of The Gospel Station Network and Pastor of the Union Valley Baptist Church. Sharla Frederick sings lead and harmony vocals. Sharla works full time for The Gospel Station as the CFO and is the music minister at the Union Valley Baptist Church. David Frederick sings lead and harmony and is The Gospel Station's regional service coordinator. He also serves as a deacon at the Union Valley Baptist Church. Their songs are played on The Gospel Station radio stations. 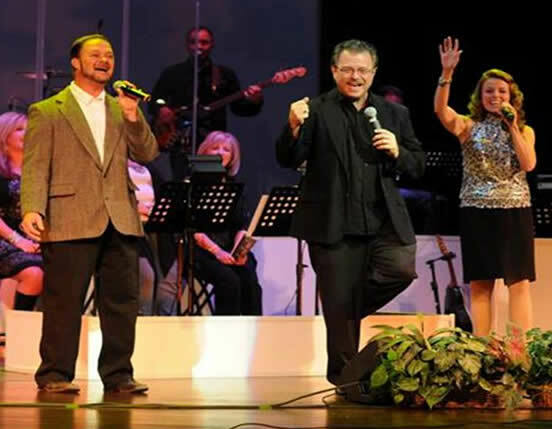 They have recorded several CDs which feature original songs as well as beloved Christian favorites in a rich 4-part harmony: "When I Got Saved" (featuring Randall) and "Take the Hand of the Master" (featuring Sharla). Southern SONlight's main goal is to lift up the name of Jesus Christ through song and to minister to those who need to know Jesus Christ as their personal Lord and Savior. To that end, Southern SONlight will go to any church of any size on a love offering basis. All money given to the group goes directly to the ministry of The Gospel Station Network.